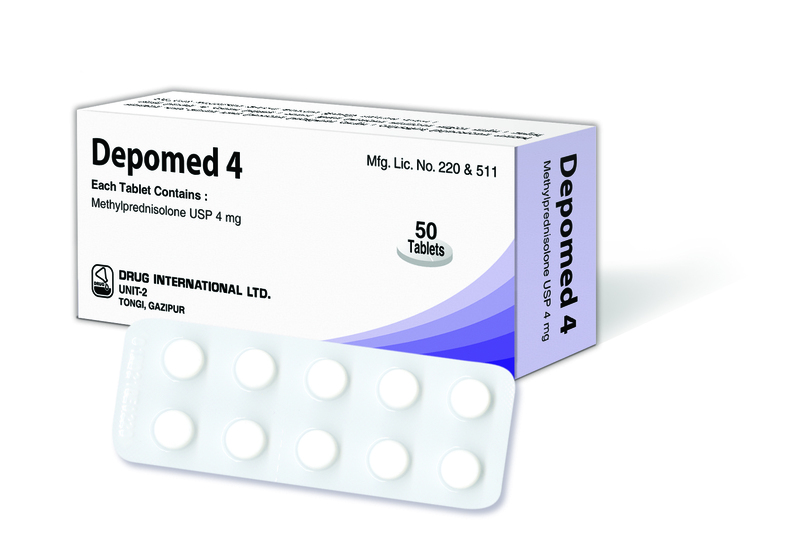 Composition: Depomed 4 Tablet: Each Tablet Contains Methylprednisolone USP 4mg. Depomed 8 Tablet: Each Flim Coated Tablet Contains Methylprednisolone USP 8mg. Indications: It is indicated for the treatment of 1. Endocrine Disorders: Primary or secondary adrenocortical insufficiency, congenital adrenal hyperplasia, non suppurative thyroiditis, hypercalcemia associated with cancer 2. RheumaticDisorders: Rheumatoid arthritis, including juvenile rheumatoid arthritis, ankylosing spondylitis, acute and subacute bursitis, synovitis of osteoarthritis, acute non-specific tenosynovitis, post-traumatic osteoarthritis, psoriatic arthritis, epicondylitis, acute gouty arthritis 3. Collagen Diseases: Systemic lupus erythematosus systemic dermatomyositis, acute rheumatic carditis 4. Dermatologic Diseases: Bullous dermatitis herpetiformis, severe erythema multiforme, severe seborrheic dermatitis, exfoliative dermatitis, mycosis fungoides, pemphigus, severe psoriasis 5. Allergic States: Seasonal or perennial allergic rhinitis, drug hypersensitivity reactions, serum sickness, contact dermatitis, bronchial asthma, atopic dermatitis 6. Ophthalmic Diseases: Allergic corneal marginal ulcers, herpes zoster ophthalmicus, anterior segment inflammation, sympathetic ophthalmic, keratitis, optic neuritis, allergic conjunctivitis chorioretinitis, iritis and iridocyclitis 7. Respiratory Diseases: Symptomatic sarcoidosis, berylliosis, loeffler's syndrome not manageable by other means, fulminating or disseminated pulmonary tuberculosis when used concurrently with appropriate anti tuberculous chemotherapy, aspiration pneumonitis 8. Hematologic Disorders: Idiopathic thrombocytopenic purpura in adults, secondary thrombocytopenia in adults, acquired (autoimmune) hemolytic anemia, erythroblastopenia (RBC anemia), congenital (erythroid) hypo plastic anemia 9. Neoplastic Diseases: For palliative management of: Leukemia’s and lymphomas in adults, acute leukemia of childhood 10. Edematous States: To induce a diuresis or remission of proteinuria in the nephrotic syndrome, without uremia, of the idiopathic type or that due to lupus erythematosus 11. Gastrointestinal Diseases: Ulcerative colitis, regional enteritis 12. Nervous System: Acute exacerbations of multiple sclerosis, etc. patient transferred to other appropriate therapy. ITSHOULD BE EMPHASIZED THAT DOSAGE REQUIREMENTS ARE VARIABLE AND MUST BE INDIVIDUALIZED ON THE BASIS OF THE DISEASE UNDER TREATMENT AND THE RESPONSE OF THE PATIENT. After a favorable response is noted, the proper maintenance dosage should be determined by decreasing the initial drug dosage in small decrements at appropriate time intervals until them lowest dosage which will maintain an adequate clinical response is reached. It should be kept in mind that constant monitoring is needed in regard to drug dosage. 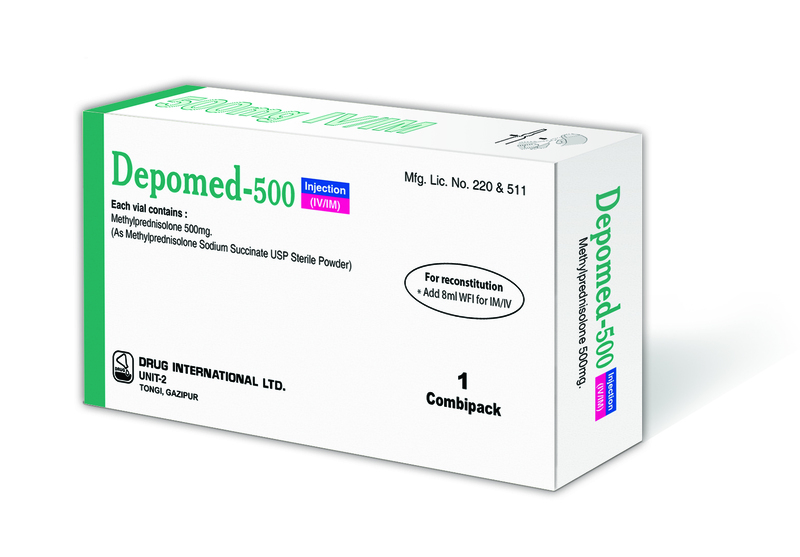 Included in the situations which may make dosage adjustments necessary are changes in clinical status secondary to remissions or exacerbations in the disease process, the patient's individual drug responsiveness, and the effect of patient exposure stressful situations not directly related to the disease entity under treatment; in this latter situation it may be necessary to increase the dosage of Methylprednisolone for a period of time consistent with the patient's condition. If after long term therapy the drug is to be stopped, it is recommended that it be withdrawn gradually rather than abruptly. Multiple Sclerosis: In treatment of acute exacerbations of multiple sclerosis daily doses of 200 mg of prednisolone for a week followed by 80 mg every other day for 1 month have been shown to be effective (4mg of methylprednisolone is equivalent to 5 mg of prednisolone). Or, as directed by the registered physician. Use in pregnancy and lactation: Pregnancy Category C. There are no adequate and well controlled studies in pregnant women. Corticosteroids are excreted in small amounts in breast milk. Nursing mothers taking pharmacological doses of steroids should be monitored for signs of adrenal suppression. It has not been adequately evaluated in nursing mothers. Packing : Depomed 4 Tablet: Each box contains 5x10’s tablets in blister pack. 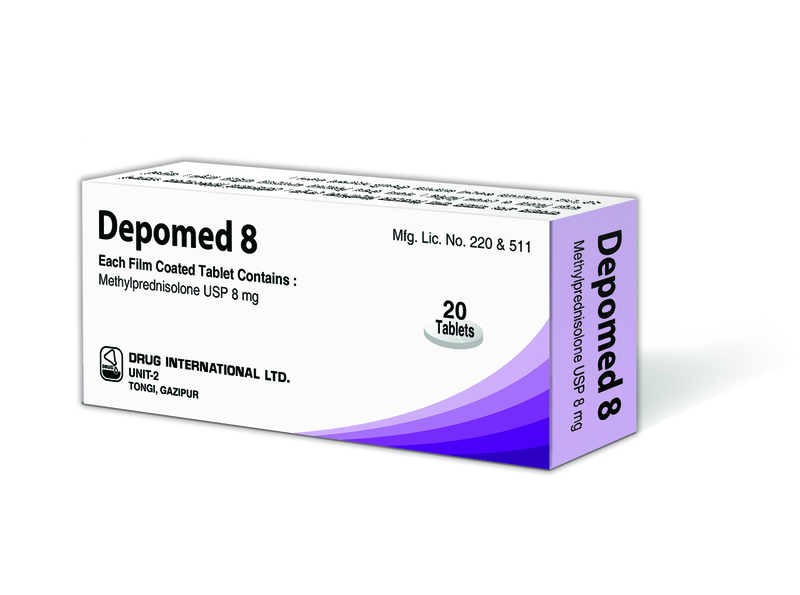 Depomed 8 Tablet: Each box contains 2 x 10's tablets in blister pack.